The lustrous dainty Swarovski Mauve Pearls Pearls deccorated & surrounded with sparkling simulated diamond cubic zircon with Swarovski 12mm Mauve Pearls exclusively for wedding Bridal Bridesmaid Brooch Round Pearls Brooch with high quality Swarovski Pearls Can Customize This brooch In your Pearls Color Will Be Swarovski Pearls Cubic Zircon spread all over exclusive for Wedding & formal wear sophisticated & elegant. 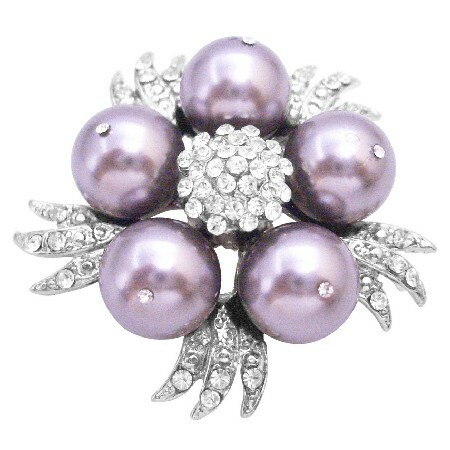 Mauve Pearls are embellished by sparkling cubic zircon buds all over with silver. Pretty & feminine describes this vintage Brooch with Good quality of Mauve Pearls & Cubic Zircon Glorious/Fabulous Pin Brooch brilliant & excellent crafted.